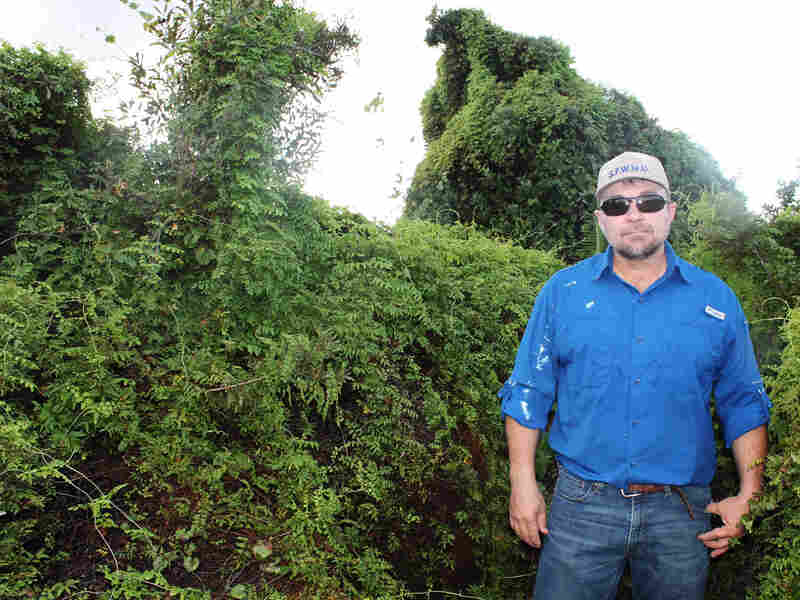 Invasive Fern In Florida Threatens To Take Down More Than Just Trees The tenacious Old World climbing fern — native to Africa, Asia and Australia — is toppling trees as it swamps the state. It also threatens to derail a national wildlife refuge. Old World climbing fern on a tree island in the Everglades surrounds LeRoy Rodgers of the South Florida Water Management District. Environmentalists say it's one of the worst invasive species the state has faced in a long time. LeRoy Rodgers spends plenty of time in the Florida Everglades — mainly in airboats. He works for the South Florida Water Management District. On a recent day, he eases his boat alongside a tree island. He doesn't like some of the changes he's seen, so he pulls a pair of clippers from a bag and hops over the side. Rodgers will need the clippers to cut a path through the Old World climbing fern that has almost swallowed the island. "A white-tailed deer trying to make your way through this," he says. "You can see how difficult it would be." The fluorescent green fern is everywhere. It cascades from trees, its vines weaving a thick mat near the ground obstructing every step. Florida has long battled invasive species: Burmese pythons, feisty lizards from Argentina, Cuban tree frogs. Now another pest is tormenting the state: the Old World climbing fern. The tenacious fern is toppling trees as it swamps the state. It also threatens to derail a national wildlife refuge. Rodgers says the tree islands dotting the sawgrass prairie here in the Arthur R. Marshall Loxahatchee National Wildlife Refuge are where birds and other wildlife forage and nest. He takes the fern in his hand. "That's where the spores are produced. ... You see they're everywhere," he says. "So there are spores by the billions all around us right now, and that's the other part that makes this plant so invasive." The Old World climbing fern first appeared in Florida as an ornamental plant and is native to Africa, Asia and Australia. With no natural predators here it grew unchecked. The fern stands to take down more than tree islands. Its grip on Loxahatchee has prompted the state to threaten to terminate its lease authorizing the U.S. Fish and Wildlife Service to manage the land. That's strenuously opposed by environmental groups in a region where a multibillion-dollar environmental restoration is underway, the nation's largest ever. "I think it is the worst invasive species that Florida has faced in a very long time," says Cheryl Millett of the Nature Conservancy. Millett considers herself on the front line of the fern's march north. She is part of a team of government agencies and private landowners monitoring its spread in central Florida. She steps among the pine trees of an 8-acre conservation area in a residential neighborhood near Orlando. The fern flows from trees like a waterfall. Crews control the fern by spraying it with herbicide and hacking at it with machetes, leaving the vines overhead to die. It's exhausting work. Back in Loxahatchee, the South Florida Water Management District's Rodgers says biologists are trying other ways to corral the fern — including experimenting with a moth and mite found where the fern originates and that feed only on the plant. A longer version of this story is available at WMFE.